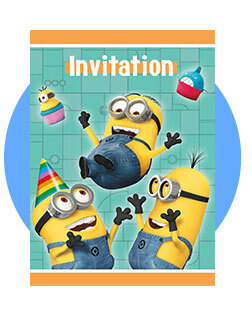 Get Gru, the girls, and the minions for your next big birthday bash when you shop for Despicable Me Party Supplies! This collection includes a big selection of tableware like dinner plates, napkins, and cups, decorations like balloons, and tons of favors like bouncy balls, paper minion goggles, personalized mugs, tattoos, and lots more! Get into costume for the journey of a lifetime! Join Stuart, Kevin and Bob as they search for their new master. Starting as single-celled yellow organisms, Minions evolved through the ages, perpetually serving the most despicable of masters. After accidentally killing off so many of them, the Minions find themselves without a master to serve and fall into a deep depression. However, one Minion named Kevin has a plan, and along with his sidekicks, teenage rebel Stuart and lovable little Bob, they venture out into the world to find a new evil boss for his brethren to follow. The trio embarks on a journey that ultimately leads them to their next potential master, Scarlett Overkill, where they must face their biggest challenge ever, saving all of Minionkind from annihilation. Often unpredictable but always a ton of fun, the Minions sound a lot like a group of children, don’t they? Enter birthdayexpress.com! 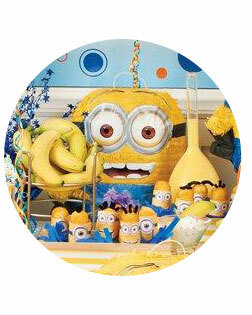 We’ve got tons of great stuff to take the “despicable” out of party planning and make the process easier than ever. Equipped with everything you’ll need, our party packs are your all-in-one lifesaver and just one way we can help. Calling all Minions! Please join us in our secret lair on Saturday June 27th for Ethan’s 8th birthday. We’ll have all the stuff to celebrate the upcoming movie release, plus some extra surprises! So get into costume as your favorite character and join us for a fun-filled day of Mionionizing! Join hands with Gru, Margo, Edith and Agnes in wishing your little one a very happy birthday, and set up your secret lair in everything Minions with our Minions room, whoops I meant lair decorations. Get your little one in on the fun and get the decorating started. Start with our Minions-themed balloons and let your imagination join the fun with some DIY creations. We’ve got all kinds of wonderful stuff to completely transform your living or party room into a comically villainous secret hideout! Balloons are always a great place to start, and our Minions-themed balloons easily fill the air with Minions galore. Let your imagination join the fun with some DIY creations. We’ve got all kinds of wonderful stuff to completely transform your living or party room into a comically villainous secret hideout! Transform your living or party room into a comically villainous secret hideout! Our Minions decorating kit provides you with two honeycomb centerpieces 6" high, four hanging swirl decorations at 3' long, and 1 flag banner at 8' long. Now go forth and create your lair! Embrace all the Minions' zaniness with eye-catching, entertaining tableware. Set your fab party table with mix-and-match Minions tableware and napkins. 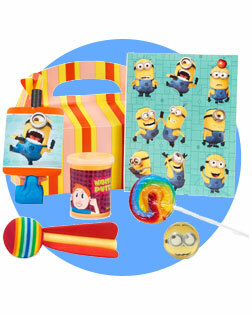 Choose from a spectrum of colorful place settings in all things Minions with these themed designs. Let your guests savor each sip with Minions cups printed with those one and two-eyed bespectacled creatures. Keep little hands clean and tidy with Minions-themed printed napkins. Let them eat cake served on Minions dessert plates. Surprise your guests and give them something to remember by adding a touch of Minions character style in the form of a little goody bag placed at each setting. After all, everyone loves presents! As we all know, perhaps the most difficult aspect of planning a birthday party for kids is dreaming up activities to keep the little scamps occupied. You know as well as I do, if you don’t have activities to keep your little ones engaged, chaos is sure to ensue. Lots of sugary treats and the excitement of a party can easily result in one rambunctious group! So, to help you keep your sanity, we put together a list of kids’ birthday-party activities to get you started. Birthday parties and themed parties are all fun and games, but the Minions Piñata Kit “hits” the spot perfectly! Not only is a piñata fun for kids of all ages, they’re now easier than ever to feature at your child’s celebration. Just one click bundles everything you need to take a crack at this engaging activity. Minionize your party room with these easily removable wall decals. You can also add a fun and creative dimension to a child’s bedroom as well. They stick to virtually any smooth surface, including walls, dressers, headboards, closets, mirrors and doors. Hike up your overalls and get ready to party in your secret lair with everything Minions! Those crazy, zany characters are at it again. All your favorite characters are featured on a huge assortment of decorations and party favors, including tableware printed with those one and two-eyed bespectacled creatures. We’ve got plates, napkins, invitations and cups for starters, but don’t stop there. Our super selection showcases minion buddies blowing horns, tossing each other around, and basically being as happy as minions can be. Embrace all the silliness with these eye-catching and entertaining party favors! Here’s a great way to keep the celebration going long after your last guest has left. Send your guests home with a Minions Favor Box. The Minions Favor Box comes complete with lots of themed treats! Set one out at each place setting to send home some fun with each guest as they leave. It’s the perfect way to send your guests home with memories of a fabulous time! 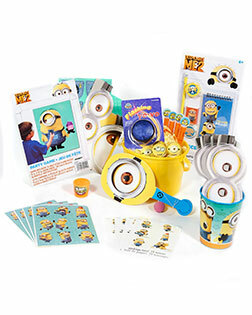 Who can say, “Minion Mania?” We’re here to help you “Minionize” your next party by adding all the marvelous Minion-themed party favors you can imagine. All your favorites can be put into the bucket to help you set the stage for bringing your next Minion-themed gathering to life!